Corinthian was built for the Allan Line by Workman, Clark & Co., of Belfast. Launched in 1900, she made her maiden voyage from Liverpool to Québec and Montréal on 24 May of that year. In 1903, Corinthian began serving Allan's Glasgow-Canada route. Originally configured to carry first, second and third class passengers, she was converted to second and third only in 1908 and was soon thereafter switched to London-Canada sailings. 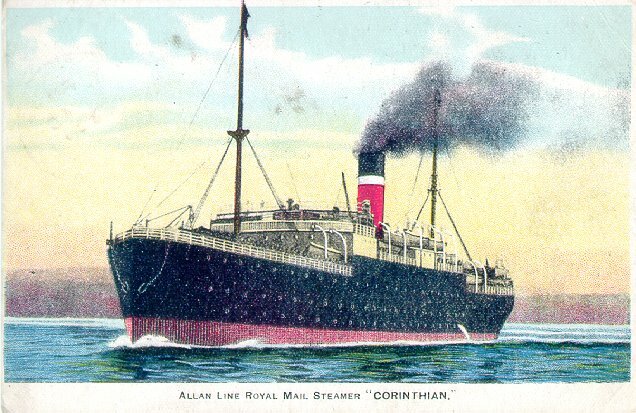 Used as a troopship for the Canadian Expeditionary Force during World War I, Corinthian became a part of the Canadian Pacific fleet when CP took over Allan in 1917. On 14 December 1918, Corinthian was wrecked in the Bay of Fundy. There were no deaths, but efforts to salvage the ship were soon abandoned and she was declared a total loss. Source: Haws' Merchant Fleets; Bonsor's North Atlantic Seaway.